I recently posted my front porch makeover that all started with that quart of paint from Modern Masters. Once I painted my front door, I knew I had to do something to my desperate-looking front stoop. But this post is all about our “porch” – that slab of concrete that greets our guests. Ugh. This would be embarrassing, if I cared about what people thought about my front porch. I will admit, though, I’m sure glad it doesn’t look like this anymore! 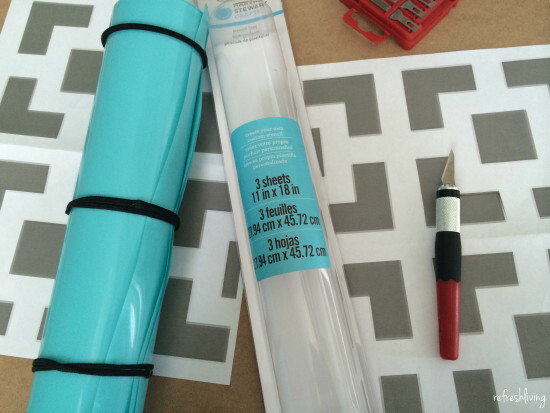 I’ve seen stenciled floors popping up lately, so I set out to create my own DIY stencil, the good old fashioned way, sans fancy cutting machines (that I don’t own, yet…) and graphic editing software (that I have no idea how to use). 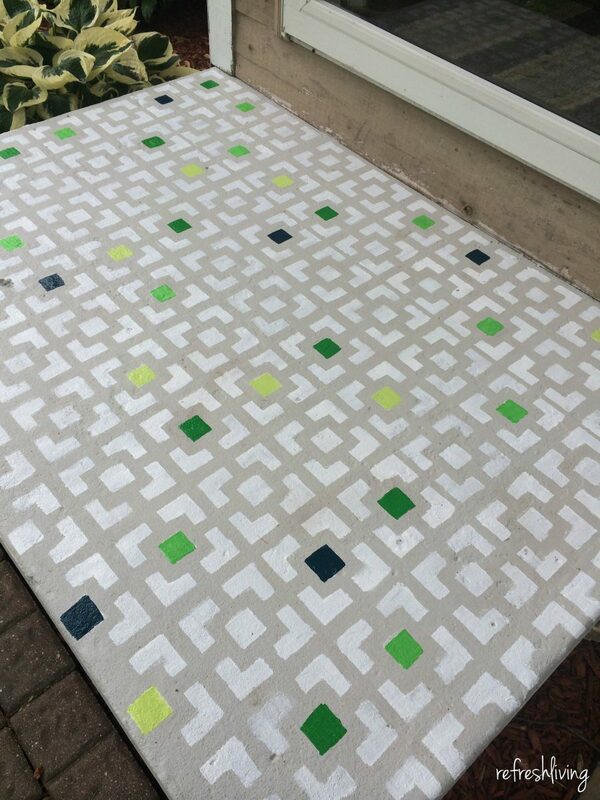 To create this stencil, I headed over to my trusty pal Google and searched for “stencil pattern” or something like that. 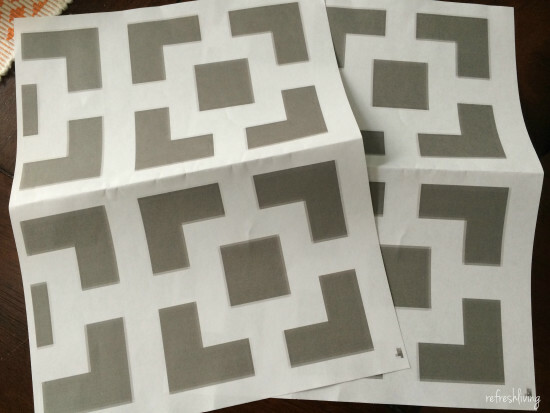 I found a pattern I liked, saved the image, and opened it in Microsoft Word. Yes, you read that correctly. Microsoft Word. (I told you I’m not good with that editing stuff. Probably something I should invest some time into improving.) I stretched, and stretched, and stretched the pattern out until I had two massive designs on a page, and printed off two sheets. I used Martha Stewart stenciling material for this project, and the material itself is great, but the roll it comes in, annoying. A piece of plastic that’s been rolled in that package for who knows how long does not uncurl very easily. In fact, even after laying it under tons of heavy books for 12 hours, rolling it the opposite way and securing with rubber bands for another 12 hours, and taping it flat to a panel for another 12 hours, it still wouldn’t stop curling. If you know a trick to stop this, please let me know. As it was taped down to that cardboard panel, I used an exacto knife to cut along the printed edges. I painted the concrete with Revitalize in Cape Cod- which is Pittsburgh Paints version of the wood and concrete surface repair paint. We’re using the rest of it on our deck at the cottage, so it was worth the splurge (and I know will last a lot longer than normal exterior paint). After it dried for 24 hours, my curly stencil was ready for some action. If you have a curled stencil as well, I found it worked better to fight the curl by letting it curl up, and then taping it down. Far less paint could sneak through gaps when I placed it this way. 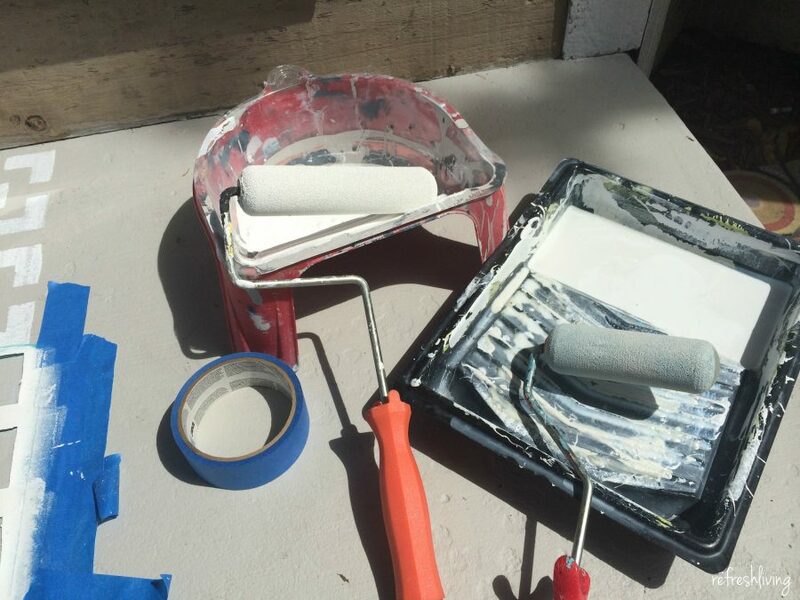 (I know it looks like the paint would go right under those curled up edges, but if you roll with the curl, rather than into it, you’ll be fine. It means you’ll be changing your roll direction a lot, but it creates much cleaner lines. 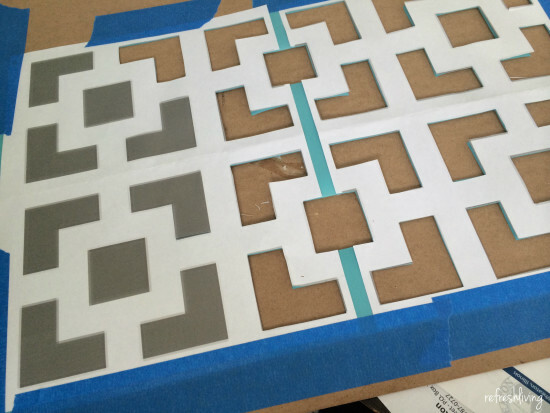 Speaking of sneaking paint and clean lines, if you’ve ever used stencils or painter’s tape, you know how frustrating it is to prep everything and paint, only to lift up the stencil and find that dreaded paint seepage. I’m telling you, I know how to virtually eliminate that from happening. I’ll share all the little secrets, because it seriously works, every time. For for now, I’ll tell you that I taped my stencil down, painted a layer of clear shellac down, waited for it to dry, and then painted a layer of white exterior paint. Okay, I may have just revealed some of my secret. 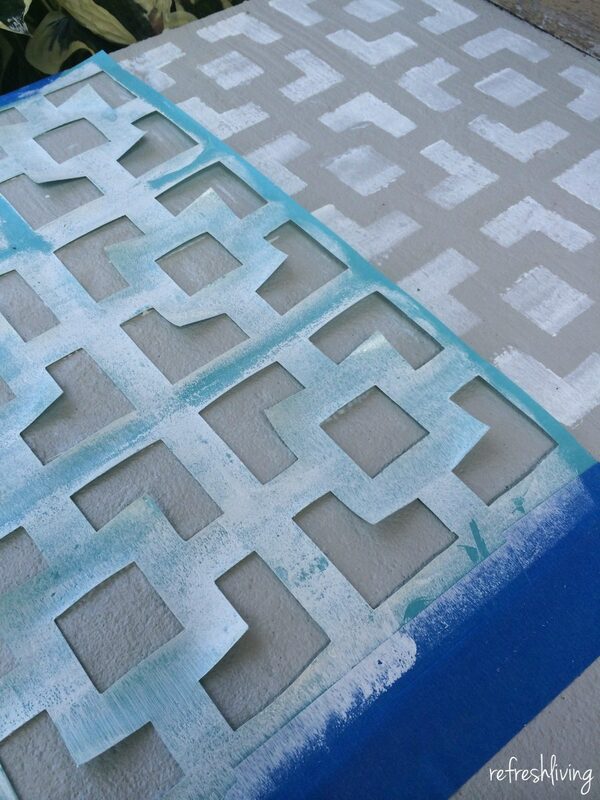 See how the shellac seeped under the stencil? The image on the left is before it dried. Two minutes later, I took the photo on the right, and never touched it once. The clear shellac seeps through, but then when you paint your color on top, it doesn’t seep through, because the shellac already beat it to it. It looks messy in the left because the shellac goes on milky white, but then dries clear. Can you image how horrible it would have looked if I had just painted it once with white? I have 3.5 other tips on how to get perfectly clean lines, so you should check it out, even though I just gave away the best .5 of the bunch. 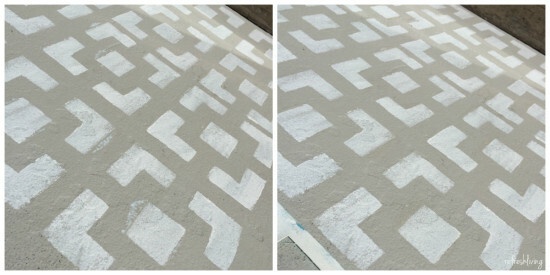 After moving the stencil 16 times (thank goodness it’s a small patio), I left it dry overnight and added the colorful splashes of greens and navy blue the next day. Two coats of clear shellac sealed it all in, hopefully to help it withstand some foot traffic. I may have just drawn more attention to my least favorite area in our house and yard. Although, now that it’s been updated, I may have a new area I despise even more. If I moved the camera about three feet to the right you’d see it. The railroad tie lined “landscaping” bordering the gravel driveway. Sigh. Baby steps. Jenny, great job on your front patio. I love that you created the stencil the old fashioned way with cardboard:). Hope you are having a good weekend! 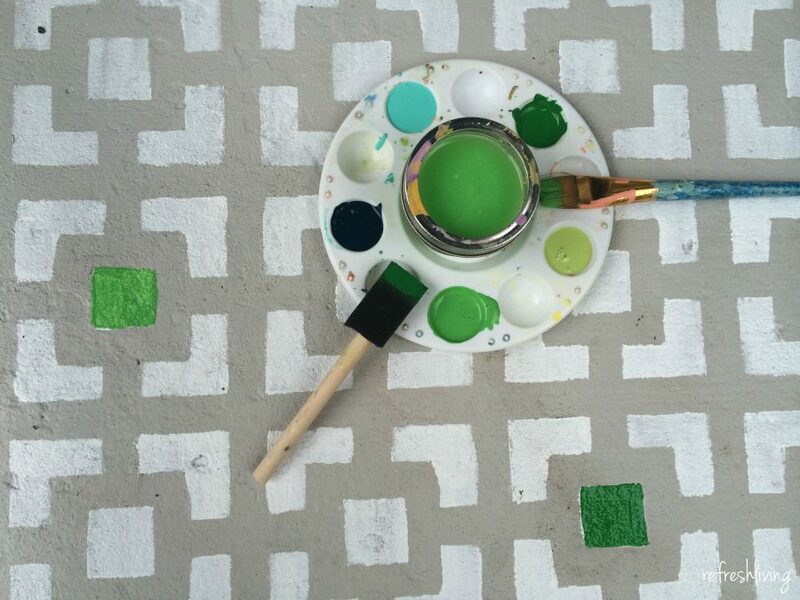 Love the pops of color in the stenciling. What a fun project. Thanks for sharing at The Creative Circle. 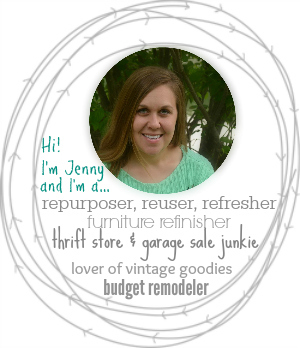 I just love this project Jenny! 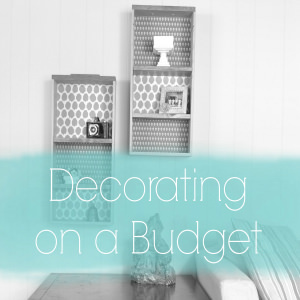 Such a great way to make a stencil too….I may just have to steal this idea. Hi Jenny! This looks fantastic!!! I want to copy!!! Looks amazing and what a great idea!!! 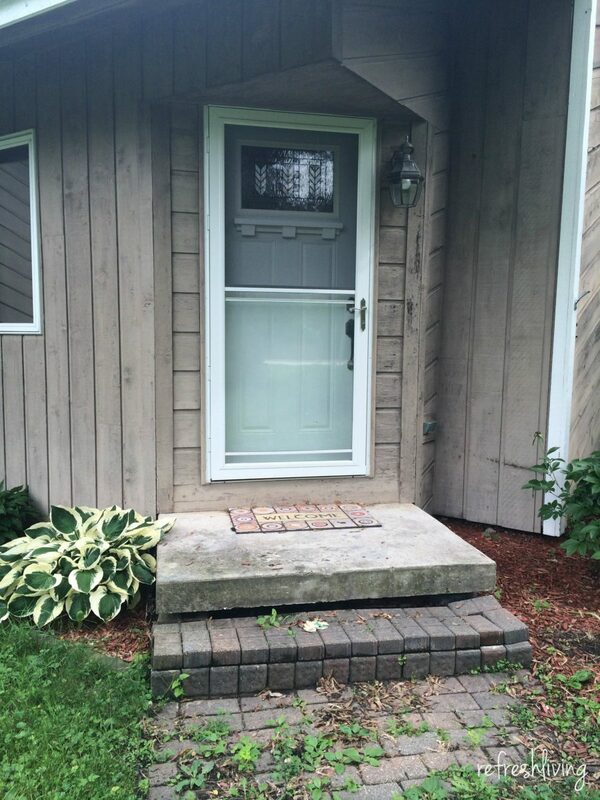 The makeover to your front porch looks great! I like how you added in your description “no fancy cutting machines or editing software needed”- I appreciate that! 🙂 I like how the mat fits everything perfectly. 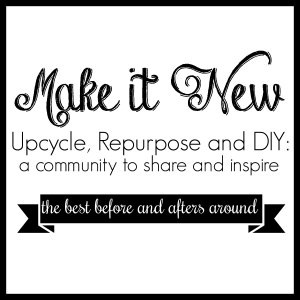 Thanks for sharing and linking up at TALENTED TUESDAY link party. Hope you are having a great summer! Fabulous Jenny!! Clever girl. I was thinking about the curly stencil material. What if you blow dried it to warm it up a little and then put books over it to hold it flat till cooled off? That might work?,?! 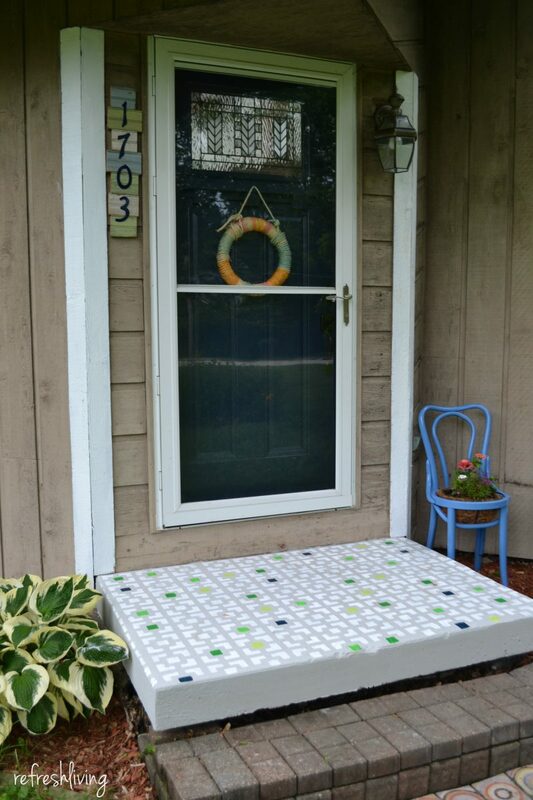 My small porch is connected to my sidewalk, but I am definitely borrowing your idea for the whole enchilada!! Oh how I hate scrambling around on my knees though. I’m a 62 year OLD woman!! But that’s the price of beaut, right??? Totally love it! I live in Wisconsin. Do you think it will hold up to the cold! Snowy winter? Thanks, Peggy! I sure hope it holds up to all the snow and cold! I hope that the coats of shellac will help with that, and the fact that it is semi-covered, but only time will tell. I’ll try to update the post after this winter. Thanks for stopping by!